We get to travel the world, go all the way to Antarctica and make amazing discoveries. Or something like that is at least what a lot of people expect from our work. Sorry, to disappoint but currently, science might not be so glamorous at all times. Three people, three colleague graduates, two with a PhD and what are we doing most of the day? We dig! We dig up our equipment. We make our changes to it, put it back into the hole and dig snow on top of it. Next week, probably, we will even dig some of them back up to do studies of the reflectivity of the border between ice and water. Wait, before I complain more about the digging -- reflectivity? What are we studying? ARIANNA's design relies on the fact that the boundary between ice (from the ice shelf) and water (seawater from the ocean) is intransparent for radio emission. 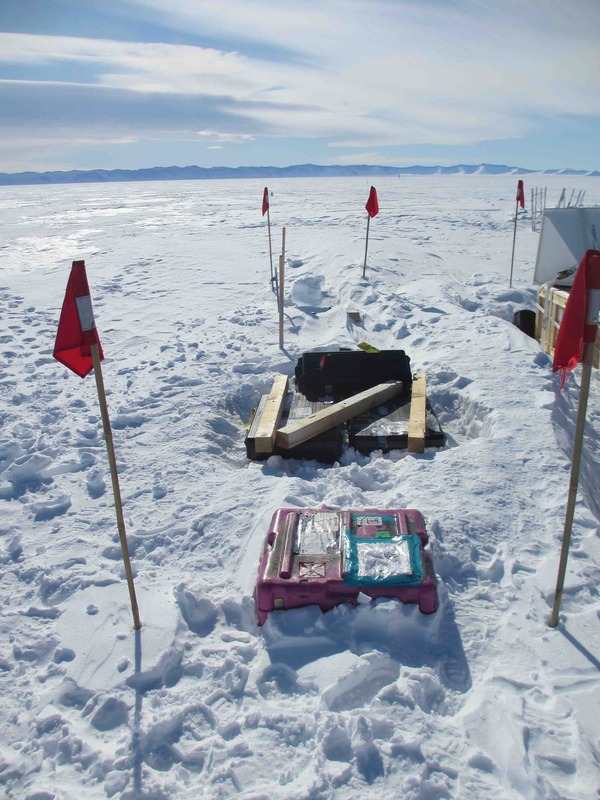 A neutrino that interacts in the ice will create radio emission. However, the neutrino is down-going which would bring all of the emission to the bottom of the ocean, if is wasn't for the boundary layer. The transition from ice to water acts like a mirror for radio emission. (Hard to imagine? You sometimes can't see the bottom of the swimming pool, if you look at a wrong angle, so the boundary layer between water and air becomes intransparent for light.) So, the radio emission bounces off the boundary layer between ice and water and comes back up into our antennas. So far, the design. The interesting part is now to check how perfect the reflection is. The more perfect the better, of course, but also with not 100% perfect reflection we can find our neutrinos. We only need to know about the properties, so that we can correct our analysis. Some measurements have been done in the past, but since they are time consuming (DIGGING!!) there are more to be done. But things are looking good! For future purposes, we will, of course, not dig up every single station -- that would be far too many for an array of 1000 stations. 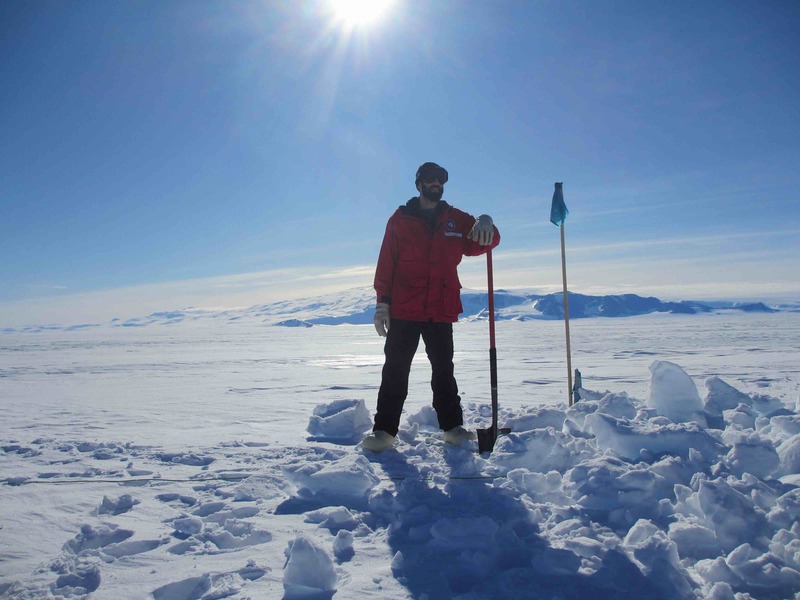 Projects like the ones from our ROSETTA colleagues (see one of my earlier blogs about using an airplane to measure the Ross ice-shelf) will certainly do the trick. Apart from digging, what other glamorous activities keep us busy all day. One very important task is sweeping the floor. To cite Corey: "Water is so much easier to sweep up, if it is frozen." 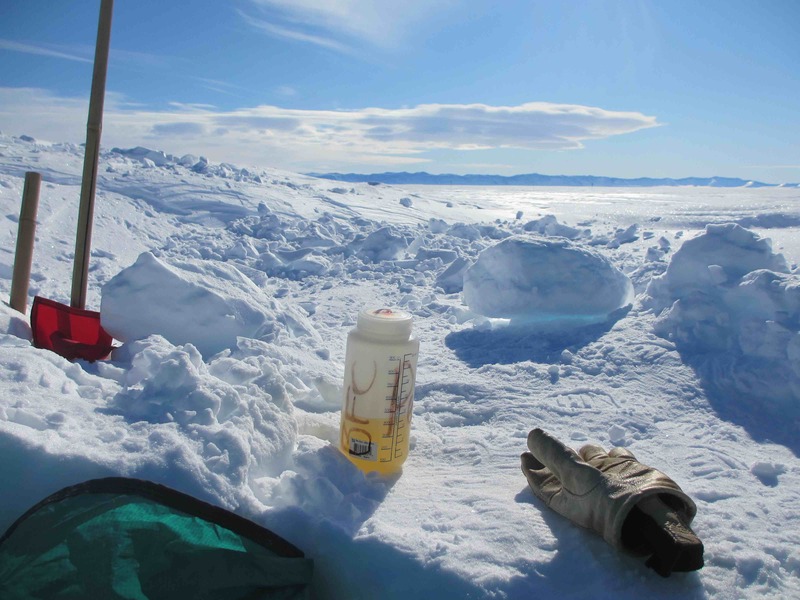 Since our tent reaches cozy temperatures of 10 degrees C, snow and ice have the tendency to melt. 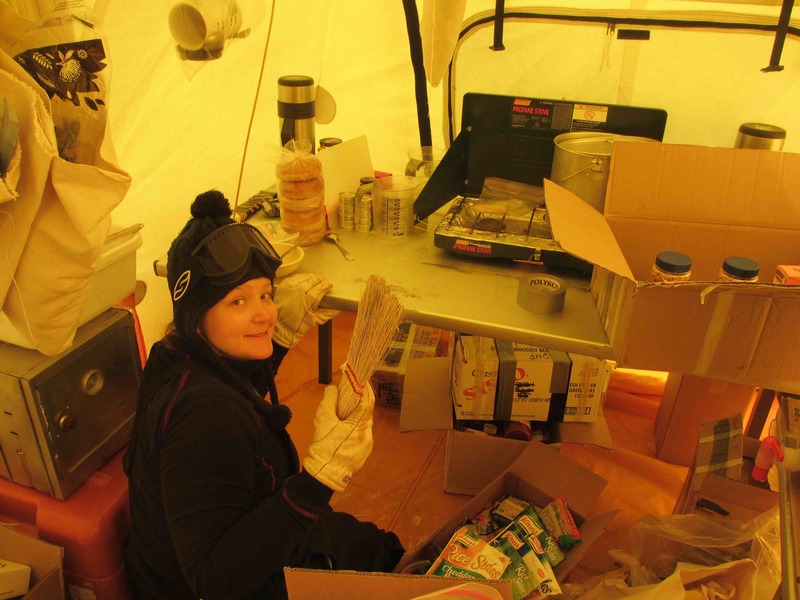 And, if everything outside of your tent is covered in snow (well, Antarctica, it was to be expected) there is almost no avoiding of carrying it in. Furthermore, water vapor will condensate on the walls on the tent, run down and freeze back up at the bottom of the tent. So every morning, someone has to glamorously get down on his/her knees and do the sweeping round. You wonder about the clutter in our tent. Well, one single tent has to fit our kitchen (in the back) and two tables to "do science on". Do science on? Well, every change that we want to make to the stations, like exchanging the batteries, needs to be done after all. And this is not like changing the batteries of your digital camera, click out, click in. It involves Chris soldering on little lugs to the batteries that we ordered and assembling them into the station box. A little bit like Tetris for experts. 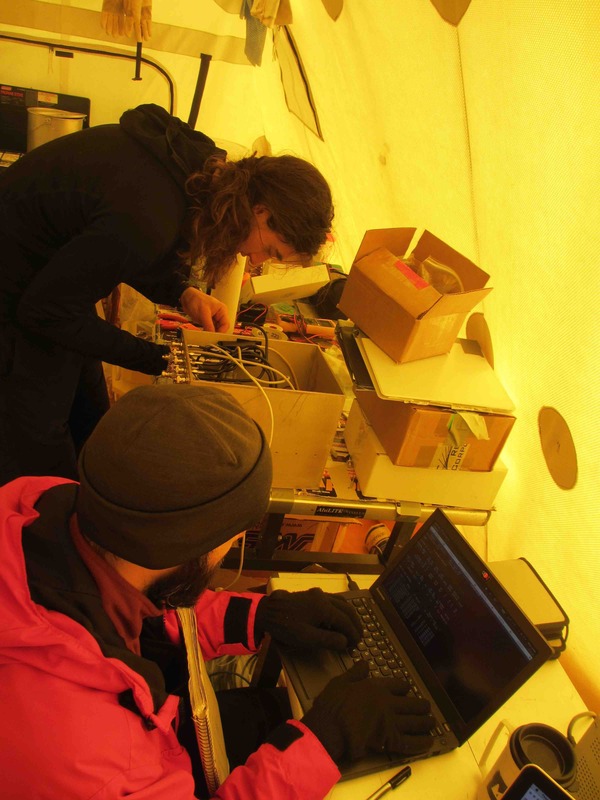 To make matters more interesting, all the fancy soldering irons do not work in Antarctica. Too dry, too cold, too unstable power, who knows. Only the really basic ones work. So, lesson learned here, go for the bargain bin soldering iron, they don't get stopped by anything. However, the work gets very gritty, if your soldering iron is very ... Hey, welcome to glamorous science! On a general note, it is quite interesting, how modern day science works. The collaborations get bigger and bigger. For example, thousands of people work at the experiments at the colliders in CERN, Geneva, Switzerland, but the fame for discovering the Higgs boson went mostly to the two spokespersons of the detectors at that time. All engineers, graduate students, post-docs and scientists, who puzzled the detectors together and spent countless hours measuring little components are on the author list of the articles in the end, but the fame never really trickles down. This is usually not the fault of the spokespersons, they know that they could not have done the experiment on their own. But politics and the media, find it so much easier to have one person and one face to represent a scientific discovery. But, let's not get too philosophical for the moment, we should return to more basic topics. Like the bathroom issue. Despite my promise that I would not go into too much detail, I got specific questions: I am sorry, but the instruction video on how to use the funnel and how to work the bathroom tent, is not happening. We have decided to go for a PG 13 rating of this blog, so no, not happening. I can, however, share the beautiful view out of our bathroom tent with you.